It’s the third day of E3 press conferences, and Ubisoft just took their turn. 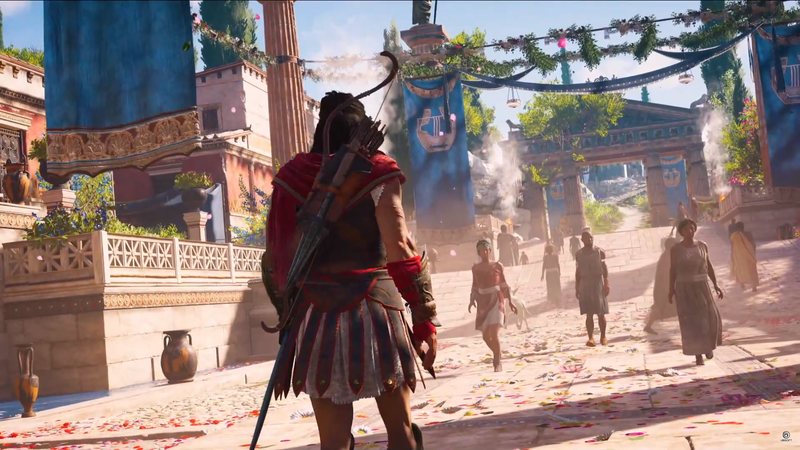 The Parisian publisher showed a bunch of Assassin’s Creed Odyssey, some hot Skull & Bones pirates, and announced a Star Fox crossover as well as a new Trials game. Let’s go over everything Ubisoft announced. They started with an appropriately ridiculous Just Dance 2019 dance number. There was a big dancing panda, and a drum line, and the tenor player really got it done. It was great. Never change, Ubisoft. Just Dance 2019 is out in October, and among other platforms is coming to the Nintendo Wii. Ha. We got to see more of Beyond Good & Evil 2. The trailer didn’t give much more of a sense of how the game (a prequel to the original) will play, but it did end with a reveal that BG&E star Jade will indeed make an appearance. Maybe she’ll be a villain? The developers weren’t clear, though they said she’ll play a major role in the game. After that, they showed some pre-alpha gameplay on stage. It looked neat enough, though hard to really say. You can play the game alone or “with your friends in co-op.” They then talked about how they’re working with Joseph Gordon-Levitt’s HitRECord, a program they’re using to allow people all over the world to contribute art and other work for the game. JGL came out to talk about it, and he was very handsome and charming. But it kind of seems like they’re using this service to crowdsource game development on the cheap? Color me skeptical, anyway. Gordon-Levitt took to Twitter immediately afterward to clarify that they do pay their contributors, but yeah, this is gonna be one to ask Ubisoft about. Trials returns with Trials Rising. I’ll admit I’ve always wanted to like these games more than I actually do, but they’re definitely fun and often hilarious, and I get why people love ‘em. The new game looks like it’ll have more of the usual collection of ridiculous obstacle courses and gnarly wipeouts. There’ll be a closed beta later this year, and the full game is out in February of 2019 for PS4, PC, Xbox One, and Switch. At this point, what games aren’t coming out in February 2019? The Division 2 will get raids and free DLC. The game’s creative director came out to explain the narrative setup for the game: It’s seven months after the initial viral outbreak that kicked off The Division, and America has degenerated into civil war. He also said it’ll get eight-player raids, so you can team up with seven buddies to go dispense some White Hot American Justice(TM). After release, it’ll get three free episodic DLC packs that will introduce new areas, new stories, and new activities. Ubisoft Massive has clearly learned a lot as they’ve labored to improve and expand the first Division, and I’m looking forward to seeing how they apply all of those lessons to a full-blown sequel. There was a charming musical performance for Mario + Rabbids’ Donkey Kong DLC. This is mostly just reminding me that I should really play more of the base game, which I never finished. And more Donkey Kong Country Tropical Freeze, which is so good! There are too many video games. Skull & Bones sure has some hot pirates. They started with a cinematic trailer featuring some remarkably attractive pirates, considering the scurvy and poor hygiene and all. Then they showed a gameplay demo that looks pretty neat, describing the game as a shared world online game where players can team up with (or fight against) other players out in the world. Similar to Rare’s Sea of Thieves, players can work together to steal and protect loot, then turn on one another to try to claim it all for themselves. I’m still a little unsold on this game for some reason, but I’m keeping an open mind. We got another look at the creepy VR game Transferrence. Elijah Wood came out to talk up his narrative-focused VR project, which his production company is working on in collaboration with Ubisoft Montreal. While it’s designed to work with VR, you can actually play it on a screen, as well. It’s coming this fall to PS4, Xbox One, Rift, Vive, and PSVR. Also, Elijah Wood messed up one of his teleprompter lines and was very charming about it. Still probably not enough to get me on board with buying a bunch of toys to play a video game, but then again, I’m probably not the target demographic for this one. Starlink is out on October 16 for Xbox One, PS4, and Switch. For Honor is getting a new mode and a big expansion called Marching Fire. The new mode is called Breach, and pits teams of four against one another. The expansion, Marching Fire, also got a trailer and will introduce a new faction, four new fighters, some unrevealed single-player content. They described it as For Honor’s biggest and most ambitious expansion so far. Also, the starter edition of the game is free for PC players on Uplay this week. They closed out with a bunch of Assassin’s Creed Odyssey gameplay. The game takes place hundreds of years before Origins, and while it shares a lot in common with that game at first glance, it makes some pretty cool changes. You can play as either a man or a woman, navigate branching conversations with dialogue options, change the story based on your decisions, and even pursue romantic options. Our own Stephen Totilo played Odyssey at a press event in New York and wrote a whole bunch about it, so if you want a bunch more information about the game, go read that. It’s out on October 5 on PC, PS4, and Xbox One. It looks promising and I will play it. Couple Other Things: Rainbow Six Siege is now played by 35 million people and is getting a documentary called Another Mindset; The Crew 2 got a new trailer and open beta launching on PS4/Xbox/PC on June 21st. And that was it! No “one last thing” surprise like Ubisoft usually does, but oh well. We’ll be back later tonight for Sony’s press conference, and again tomorrow morning for Nintendo. After that, the E3 show floor will open and we’ll be there all week playing games, talking with developers, and sharing news as it happens. Stick around.